Lindsey Keeble joined Watson Farley & Williams in 1999 and is now Global Maritime Sector Head and a partner in the Asset Finance Group in London. She specialises in structured ship and asset finance and leasing transactions. Lindsey's practice focusses on shipping finance matters involving export credit backed products and project financing transactions across a variety of maritime and offshore assets. 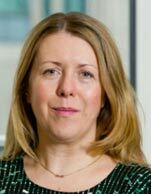 Lindsey spent four years in our Paris office where she led the English law finance practice.